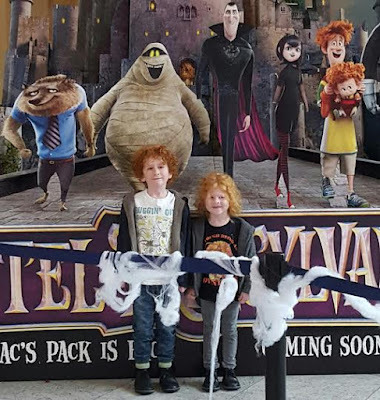 This morning we were one of the lucky families at the Odeon Cinema in Manchester for a preview screening of Hotel Transylvania 2 arranged by Mumsnet. I really liked Hotel Transylvania, as did my 2 young boys, and so we were hopeful the sequel would be good. There are no spoilers in my review. The story focuses on a vampire, Count Dracula, and his daughter Mavis, her partner Johnny and their families and friends. They run the Hotel Transylvania, a hotel originally a haven for monsters which now also accepts human guests. The storyline is okay. It continues the a message about tolerance and not judging people (or monsters) you don't know because they are different to you. The message is good but a bit garbled because (without ruining the plot) just as acceptance of difference is happening, suddenly the difference disappears and you're left wondering what the build up was leading to. This is an Adam Sandler film, and in typical Adam Sandler style the adults don't actually have to become staid and boring the minute they have children. They can still play and have fun, and actually that's one of the things I liked most about this movie - the main cast are the same characters they were in the last movie, but with a child. Everyone takes enjoyment from simple things like smiling and watching children at play, or from flying. All of the characters from the first movie are there, with the addition of a lot of extras, but it's still easy enough to see who everyone is and separate human from monster. The thriving hotel is still the main base, with a road trip in an amazing car and some more cross-country flying. In spite of Adam Sandler there isn't too much slapstick and there are just a few references to go over children's heads, overall this a very clean and inoffensive movie. 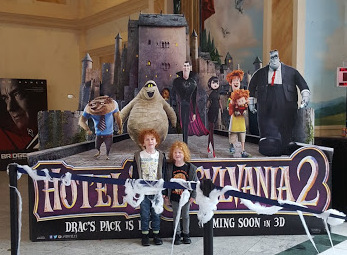 The hotel backstory is a bit complicated and there's quite a lot of dialogue, so Hotel Transylvania 2 is better suited to children over the age of 6 in our opinion, and watching the first movie before you see Hotel Transylvania 2 will help you understand some things, including the special relationship that Johnny has with his backpack, but it isn't essential. The animation is quite unique. The first movie was in some ways a little more 'still life' than cartoon, and Hotel Transylvania 2 is even more so. The background and most items are drawn in high definition, and have a real feel to them, yet the characters are just as beautiful, but caricatures. This avoids the 'uncanny valley' we feel when we watch films like 'Polar Express' or see a 'lifelike doll'. It does though mean it's a bit weird when a cartoon is using an almost photograph quality VAIO computer. For a children's movie to be littered throughout with constant references to Sony phones and other Sony products was a bit much. When a big group of kids pulled out their phones to film, they all had Sony Experia's. Naked Sony Experia's in black. This would never happen! What you'd actually see is a bunch of random phones, and even if they all just happened to be the Sony Experia, they'd have a multitude of coloured cases and skins and dangly doodads. It disturbs the flow of the story because as a parent you are just sitting there thinking "what 7 year old has or wants or is likely to ever get a Sony Experia phone, and why are you so heavily marketing such expensive items to children?". Overkill. The movie showcases some lovely new animation techniques and is beautifully done, and my favourites involve skintone and 'floating'. The skintone is gorgeous, the faces have good depth and expression and the faces are rendered really sharply, be they monsters or humans. The 'floating' was beautiful. 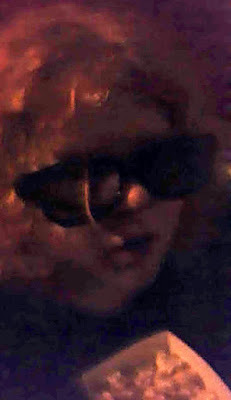 Every time someone ruffled hair or moved through dust, there would be loose hairs or dust particles around them, which floated gently and randomly towards the ground. It's really hard to fake 'random', this is the best I've ever seen and I think this is an awesome effect that sadly we won't even notice in 3 years time because it'll become commonplace. I am interested to see this 'floating' effect in 3D, as I think it'll be lovely. Bizarrely we were given 3D glasses and shown a 2D movie. I realised really quickly, most people seemed to realise after just a few minutes, but some people sat there for 2 hours wearing 3D glasses and probably went home and told their friends "3D isn't worth it. It's not as good as people make out". The stunning animation and likeable, interesting characters help carry a storyline lacking in depth and with several holes. The holes can be overlooked because the script is witty and funny and Hotel Transylvania is a good yarn. I enjoyed it, my 5 1/2 year old enjoyed it, my 7 year old laughed his socks off and loved it. My partner left feeling embarrassed he has a Sony Experia phone. Yes my thoughts were it was too heavily Sony promoted. Interestingly my husband says that they no longer have the VAIO but probably did when they started producing it. Like you say it was definitely a sequel and the change at the end was a bit bizarre (but guess the acceptance had happened). We only went to see it in 2d and ranged from 6 up to adult (including my 18 year old) and all thought it was alright. Something I enjoyed but wouldn't rush out to buy it on Blue Ray when it is released. Although maybe a DVD at nanny's house. It was a bit of a downer I have to say. I didn't comment on the event here, but something clearly went incredibly wrong and it was very hard not to be annoyed and disappointed by the time the movie started. I'm glad you too enjoyed it in the end - don't let it put you off. 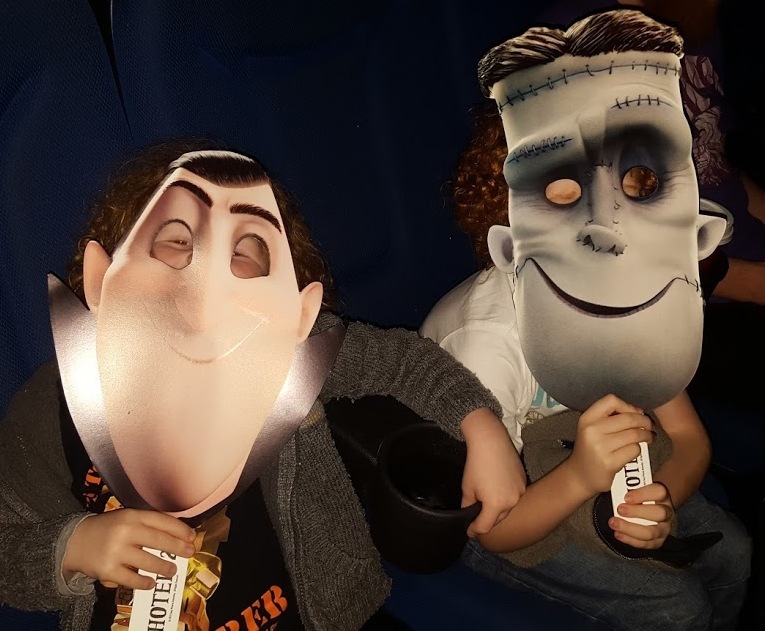 I have been to 2 other Mumsnet cinema events in the past and they were brilliant!